Swamp coolers have many positives about them from low-cost electricity prices to adding moisture in a home. Most homes that have a swamp cooler use a manual evaporative cooler switch to control their swamp cooler. A manual switch simply turns a unit on or off along with other features such as fan only manually. Manual switches work fine for many people but there are also set-it-and-forget options like a thermostat controls a regular air-conditioning unit. Installing a thermostat that controls a cooler on its own with a set temperature is easy to do and common. The wiring color codes are usually the same and even though it helps to be a handy person, installing one is not that difficult. Below is some of our favorite swamp cooler thermostat controls. The Dial 7625 is a popular digital thermostat used by many to control a swamp cooler. Like any thermostat it can have a set temperature and will automatically turn on and off a cooler. It also has other built-in features such as wetting the pads by turning the water pump on before starting the blower motor. This helps maximize the cooling power and helps keep electrical cost lower. The Dial 7625 is a good unit and worth a look for anyone looking to have an evaporative cooler turn on and off automatically. This is a classical analog swamp cooler control switch that was very popular before digital became the standard. It still is widely used but is a manual switch meaning there is no automatic on and off. While there is many other options it is a good low-cost dependable switch that works well and gets the job done. This unit from Nashone is a new unit that controls a cooler wirelessly. It has an AC plug that goes between an appliance such as a cooler and a remote control to control it wireless. The remote as a built-in temperature sensor to automatically turn on and off the cooler. It is a nice controller and easy to setup by simply placing the plug between the AC outlet and cooler. Of course the AC outlet plug location will determine if this is a good option or not. It uses a control box that works with the thermostat to control a cooler. It does require a bit more wiring compared to other options but work very well once hooked up. 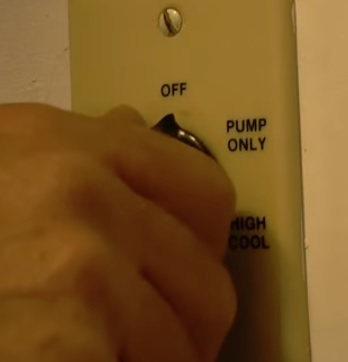 In the past a manual switch for a swamp cooler was the only option but many more options are now available. Many people still use a manual switch since they work well and are dependable, but for those looking to shut a unit on and off automatically one of the other models would be a better choice. Hooking up a thermostat for a swamp cooler is not difficult but does require some wiring knowledge and skills so be sure to call a technician if in doubt. 120/240 volts are commonly used in swamp coolers and precautions must be taken to prevent harm or damage to the equipment. As always be sure to read the reviews on Amazon or elsewhere to be sure a controller is the right fit for you. Wasn’t sure if I needed to buy relays or something other than the thermostat controller. I have the controller and will attempt this install later today. I will let you know how it turns out. (Given the E.M.T.’s fibrulator works)! Are there any week-day programmable thermostat that work with evaporative coolers? I have been told they do exist but never get an answer on which ones. I found the emerson sensi to say it has more compatibility than ever…but not sure if it will work with evaporative (ducted) air conditioners. If you have any suggestion it is kindly appreciated. I connected a Honeywell day of the week controller in series with my low voltage White-Rogers thermostat.